Welcome! Bienvenue! to the home of Alpine Racing in Jasper. JASPER SKI TEAM IN THE NEWS!! Jasper Junior Olympics Success & Smiles! It was a bluebird day to kick off the first day of the Jasper Junior Olympics on Saturday 28th February. 414 kids from across northern Alberta came out to Marmot Basin to race in one of the largest junior ski races in the world. 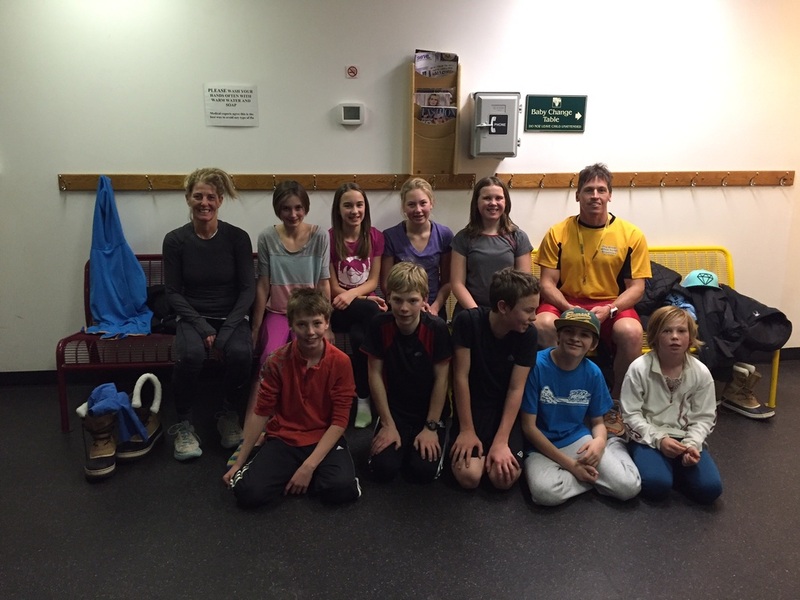 Jasper Ski Team had 29 athletes competing in the event from ages 5 through to 11. The 4 and 5 year olds spent a fun filled day flying down a course on School House. The young athletes were all clad in pyjamas to support the local charity, Find The Common Thread. The older athletes took part in Giant Slalom events on Dromedary. There were some excellent results from Jasper Nancy Greene athletes with top 10 finishes and plenty of smiles to go with. Especially impressive was the huge improvement in the athletes performances as the day went on showing a real desire to improve and challenge themselves. The team arrived at the mountain for another early start on Sunday morning, accompanied by some impressive goggle tans from the day before. The Sunday Team Event consisted of a dual slalom where the athletes earned points for their club. It was a very long and technical course but the Jasper team rose to the challenge and chalked up a good tally of points for their team. Spirits were high at the end of the day, and the athletes enjoyed some fun skiing around the mountain to cap off an extremely positive weekend. The JJO performances bode well for this weekend when the Jasper Ski Team will travel to Panorama for the Linda Putnam invitational race. The Jasper Ski Team would like to thank the parents, coaches, race organisers and Marmot Basin for all their support in making the race so successful, and a special thank you to the athletes for their hard work and fantastic spirit. CLICK HERE FOR JJO RESULTS! Capes & Crowns Cup Results! Welcome From The 2015/16 Executive! We hope that you’ve had a great summer season and that you’re looking forward to another ski season with the Jasper Ski Team! We have been working hard to prepare for the 2015/16 season and have the following fall updates for all of you! New this season: Mandatory Fund Raising Program. The Jasper Ski Team has worked hard to keep Program fees the same. In order to continue to enhance the quality of our program we have decided to discontinue the pizza fund-raiser or bottle drives, and will do a mandatory cash raffle through the Alberta Gaming Association. This will require each athlete entered in the program ( max 2 athletes per family), to be responsible to sell raffle tickets as their volunteer commitment to the Jasper Ski Team. Each athlete registered in the program will be required to sell $150.00 worth of tickets (15-$10 tickets). These will be distributed upon Registration. A post dated cheque for Dec 01/15 will also be required from each athlete with registration, in the amount of $150.00 to cover the cost of the raffle tickets. Draw Details to follow. The Jasper Ski Team will also sell a limited number of tickets at the Ski Swap and therefore we ask that families refrain from using this venue to sell their allotted tickets! Patrice Fortin is our new Fund Raising Coordinator, and Landon Shepherd is heading up our Corporate Fund-Raising Initiative. We welcome all parents who wish to help out! Should you have any questions or concerns regarding any of the programs, please feel free to contact any one of us directly!